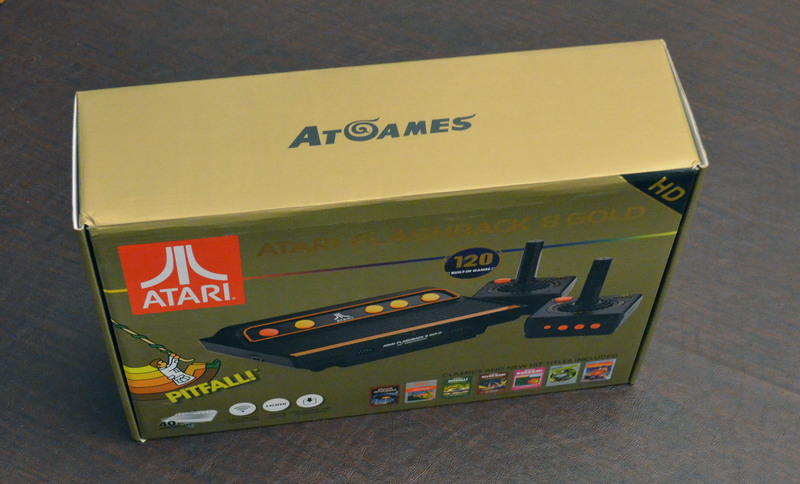 After more than a decade of Atari Flashback releases, we finally have a true next generation hardware update with the Atari Flashback 8 Gold, which will be available at retailers everywhere by the middle of November (Amazon, AtGames Flashback Zone). 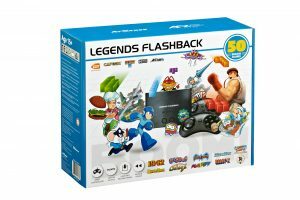 Two of the most important upgrades are true high definition 720p output optimized for today’s TVs and proper 2.4Ghz wireless controllers that no longer require line of sight with the console to work. As you’ll read a bit later on, though, the feature-list doesn’t end there. 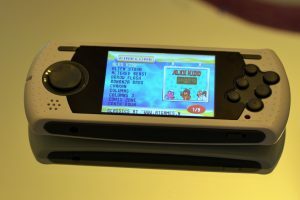 A few months back, AtGames released early review units that had some minor, but annoying performance issues. Fortunately, AtGames has used the time since to tweak overall performance and revamp the user interface. The original list of 120 games, which includes Activision favorites like Pitfall!, remains the same. In the box you get the console, two wireless controllers, AC power adapter, HDMI cable, and a folded poster that doubles as the instruction manual. 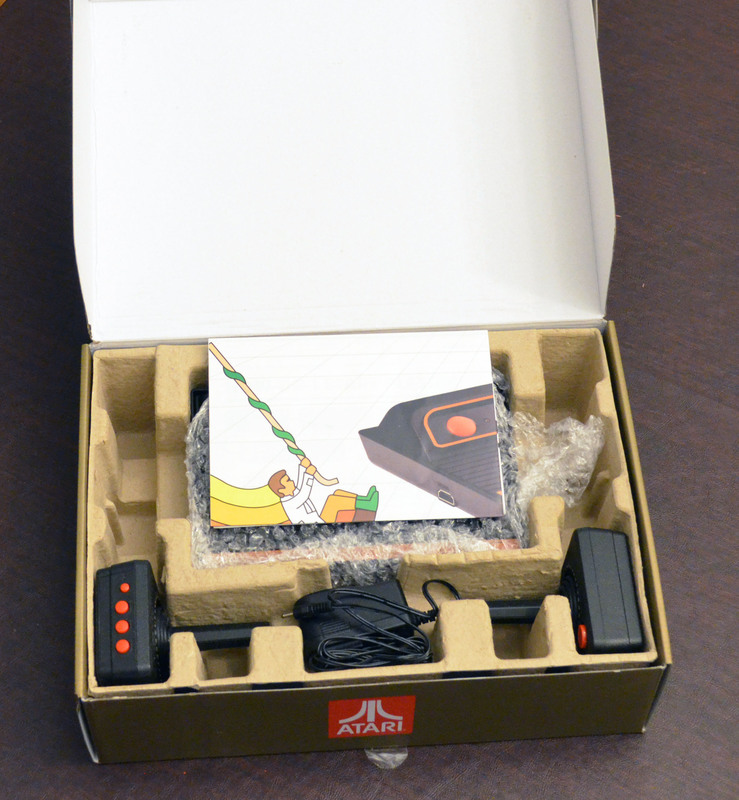 The console has its HDMI port on the left side, AC power port on the right rear, and two wired controller ports on the front for either joysticks or paddles, each of which is sold separately by AtGames. 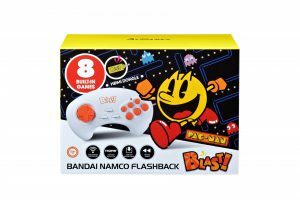 You can also of course use original wired joysticks or paddles. 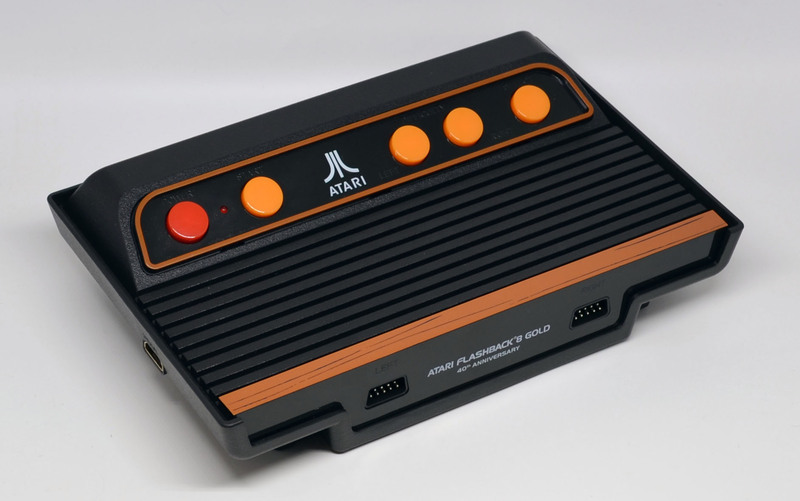 The console is loosely modeled on the design of the original Atari VCS console, but smaller, lighter, and with colored buttons instead of switches. The console buttons include POWER, START (works like RESET on the original Atari 2600), LEFT DIFFICULTY, RIGHT DIFFICULTY, and SELECT. 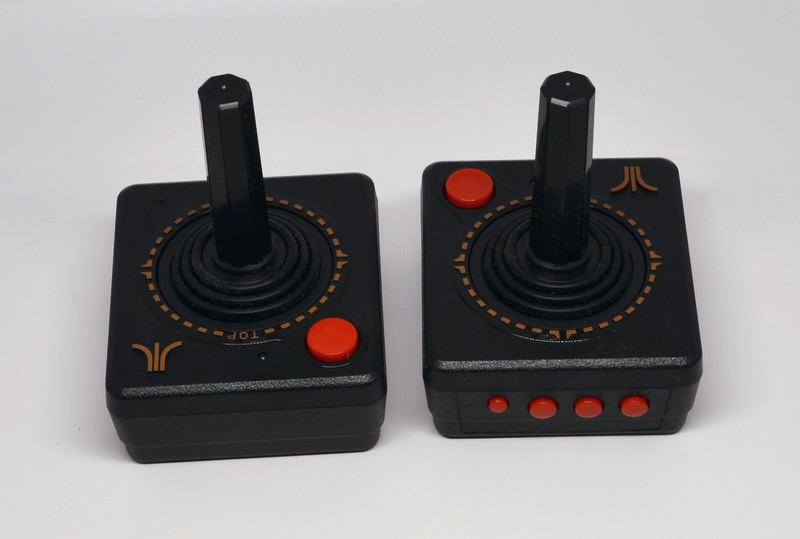 The joystick is modeled after the originals, although the action on the stick is considerably looser. This is not necessarily a bad thing, as it’s more friendly to what we’re used to these days than what we had in the past, which was much stiffer. On the player one joystick, there’s RESET, SELECT, START, and REPLAY buttons. The player two joystick is just a regular single button wireless controller. The required two AAA batteries for each controller are not included. Ability to rewind in any game for up to seven (7) seconds and resume at any point therein. Think of it as a way to re-do a bad move or two. NOTE: This feature does not apply to the custom AtGames versions of Frogger or Space Invaders that are included. Each game has up to 10 save slots available and can be resumed at any time. Think of these as save states, creating a snapshot of exactly where you are in a particular game. NOTE: This feature does not apply to the custom AtGames versions of Frogger or Space Invaders that are included. As you can tell from the videos, there are no real performance or other issues. Everything looks and sounds great, with only relatively minor differences from how the games play on the original console. When played in person, there is no noticeable lag from either the HDMI connection or from the wireless controllers. 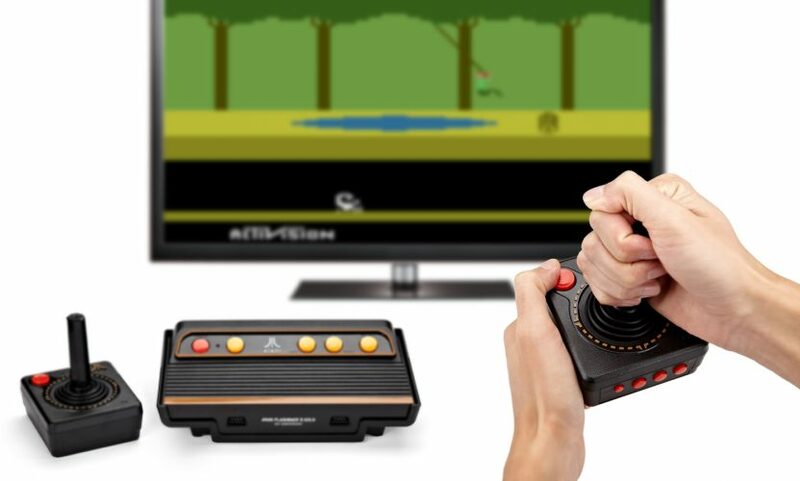 AtGames brings a large selection of plug and play Atari 2600 games into the modern era with impressive results. Sounds like a defective unit. The best option is to exchange it at the point of purchase. 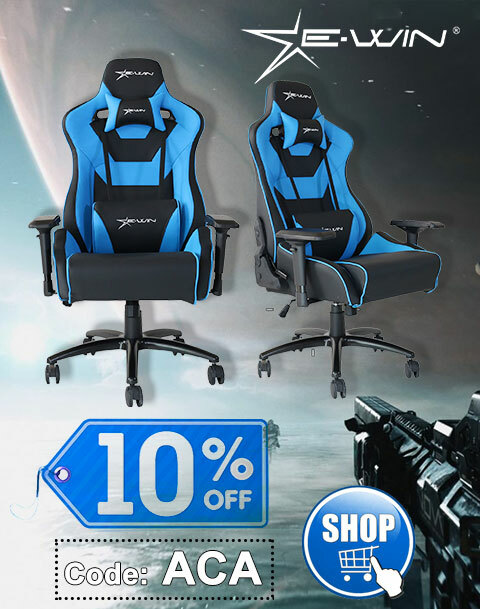 You can email info@atgames.net if you need additional assistance. mine wont play some games like bowling and haunted house. It would be strange that only a few games don’t work. It’s usually all or nothing. What is exactly the issue? How do i enter the menu in the game? To save or put the other filter on? Push down on the joystick and press Menu. I have both controllers plugged in…but I can only get one player action? Is there a menu or set up screen I’m missing? Thanks! You have to make sure the game supports two players, then if the second player (when it’s that player’s turn) uses the player one controller or the player two controller. You can check out instructions via the book, “Atari Flashback: The Official Companion” or on the Website, AtariAge (just search for the game in question). You also have to select the specific game option for two players, etc. Does the Activision edition take an ad card? No. The 2018 models are expected to.